Part-romance, part-philosophical romp, The Fault in Our Stars by John Green tells the story of Hazel-Grace Lancaster, an intelligent, teenage girl with probably-terminal cancer who worries about how her early death will hurt the people in her life, her parents in particular. Hazel-Grace's mother (whose first name is absent from the book) once expressed a fear that she would lose her identity as a mother upon Hazel's death, and Hazel desperately wants some reassurance that such a tragedy won't happen. Two people enter Hazel-Grace's life. Each of them has lost a loved one to cancer, and each coped in remarkably different ways. After his daughter succumbed to cancer, Peter van Houten, wrote a novel about a girl very like her, but a few years older, who dies the same way. Then he moved to Amsterdam and became an alcoholic and a recluse. As The Fault in Our Stars begins, Hazel-Grace has never met Peter, but has read his novel. Amsterdam: the 3rd act of "The Fault in Our Stars"
Hazel-Grace has also read many other novels about children with cancer, but found their feel-good plots artificial and intellectually insulting. Peter's book, An Imperial Affliction, is the most unflinchingly realistic depiction of terminal cancer Hazel-Grace has ever encountered. She prefers the book's honest acknowledgment of the meaninglessness of death and suffering to her support group leader's vapid attempts to make these events seem meaningful. She has also become somewhat reclusive herself, to lessen the grief her death will cause others. Her mother worries that Hazel-Grace is depressed, but Hazel-Grace asserts that her depression is merely a side-effect of dying (which, of course, everyone is doing, at different speeds). Enter Augustus Walters, Hazel-Grace's love interest and the impact character of The Fault in Our Stars. Augustus has also battled cancer and appears to be winning. Augustus lost a girlfriend, Caroline Mathers, also to cancer. The experience of watching Caroline's rather ugly death (she had a form of brain cancer that gave her an increasingly nasty personality), seems to have made Augustus determined to be relentlessly optimistic. Even though cancer already took from him his greatest talent (basketball) he is determined to do something significant with his life and claims to be on "a roller-coaster that only goes up." Of course, readers can easily recognize this as blind optimism. Roller coasters always have a big fall, and this statement foreshadows the downturn which Augustus's life will later take. Nonetheless, when Augustus meets Hazel-Grace, he is struck by the fact that she bears a physical resemblance to Caroline. Hazel-Grace challenges Augustus's optimism with a quote from Peter's book, and the two are instantly attracted to each other. Of course, we're not here to do a book review, nor to debate the literary strengths of The Fault in Our Stars. (Be warned though: there are spoilers coming.) Our bailiwick is helping writers understand dramatic structure and how it contributes to a story's appeal. Peter's book ends abruptly when the main character dies. This creates a problem for Hazel-Grace who wants to know what happens to the other characters. Her desire symbolizes her need for reassurance that her parents will be all right after she dies. The problem of how to carry on with your life after losing a loved one to cancer is a concern that affects or involves most of the characters in The Fault in Our Stars. If Hazel-Grace does not get the reassurance she seeks, she appears likely to stay depressed and isolated. She may fail to live what life she has. Peter is a warning of who she might become if she stays with her current outlook. Hazel-Grace gets to personally experience being a survivor when she falls in love with Augustus and then loses him to cancer. Along the way, she comes to understand why people cling to ideas that comfort them, even when they are false. The example of Peter shows her the high price of unflinching realism. When Hazel-Grace's mother says she is finishing her degree, Hazel-Grace realizes that her parents will be all right without her. Hazel-Grace looks at a Facebook page featuring people's memories about Augustus's girlfriend and her death from cancer. She concludes: "Caroline Mathers had been a bomb and when she blew up everyone around was left with embedded shrapnel." Hazel-Grace worries she might similarly be a "grenade" whose death will harm those close to her. She hesitates to form a romantic relationship with Augustus for fear of hurting him the way Caroline did. Hazel-Grace is also troubled by her memory of her mother expressing her fear that she will lose her identity as a mother if Hazel-Grace dies. Augustus tracks down the email address of Peter's assistant and begins a correspondence with the writer. He comes up with a plan to use his Genie Foundation wish to take Hazel-Grace to Amsterdam. He convinces Peter to come to his funeral and answer Hazel's questions. Having lied to his daughter to ease her passing, Peter cannot bring himself to give Hazel-Grace answers that will comfort her, but which he feels are false. About important matters, he is compelled to be brutally honest. So he lays down a precondition that he will only answer her questions if she meets him face-to-face in Amsterdam. He hopes she won't. A second precondition is that Hazel-Grace must get her doctor's permission to go to Amsterdam. A relapse, in which fluid collects in her lungs (as it did once before), makes this stipulation hard to meet. 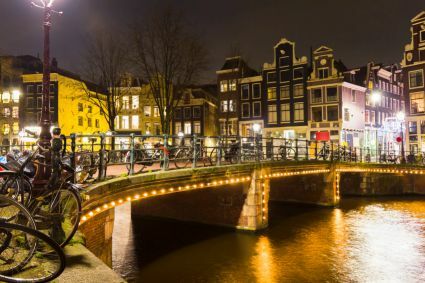 For Hazel-Grace, breathing is difficult most of the time, but no more so than when climbing the numerous flights of stairs at the Anne Frank museum. It is worthwhile however, because the top floor is the place where she realizes she wants to live. Hazel-Grace and Augustus's exploration of romance and sexuality -- part of normal teenage development -- was cut short when they contracted cancer. Through their relationship, Hazel-Grace discovers that she can be "turned on," that she can flirt, fall in love, and be sexually active despite her illness. Progressive plot elements differ from static elements in that they must appear in a set chronological order in a story. For instance, it would make no sense for the resolution of a plot to happen before the crisis. Hazel-Grace's mother makes her go to the cancer support group, which Augustus attends for the first time. Result: they meet. Act 1 (Setup): Hazel admires the realism of PVH's book, but wants to know what happens to the other characters after the main character dies. She is concerned what will happen to her own parents when she dies. Driver 2 (New opportunity): Augustus contacts Peter, raising the hope that Hazel-Grace can get her answers. Act 2 (Complication): Augustus shares Van Houten's letter with Hazel, and she devises a list of questions to send Van Houten, hoping he can tell her what happens to the characters after the book's abrupt ending. Van Houten tries to put her off, but she and Augustus mistake his letter as a genuine invitation. Hazel has a relapse which nearly prevents the trip. Augustus's cancer also returns, but he hides this fact and arranges to use his Genie Foundation wish to take them to Amsterdam. Driver 3 (Point of no return): Augustus and Hazel-Grace go to Amsterdam. Act 3 (Move to crisis): In Amsterdam, Hazel and Augustus meet Peter, but he refuses to give satisfactory answers to Hazel's questions. Augustus's cancer returns. He deteriorates rapidly and persuades Peter to come to his funeral to finally give Hazel-Grace her answers. Driver 4 (Crisis): At Augustus's funeral, Hazel-Grace chooses to say the falsehoods that people find comforting, rather than the more honest eulogy she prepared. She seems to have given up her quest. Act 4 (Move to resolution): After Augustus's funeral, Hazel-Grace finds out that Augustus was writing something for her. It might be a sequel to Peter's book. Hazel-Grace searches for Augustus's final words. Hazel-Grace learns that her mother has earned a degree and will have a life as a social worker if Hazel-Grace dies young. Driver 5 (Resolution): Hazel-Grace's questions are answered, now that she knows firsthand what it's like to be the survivor rather than the “grenade.” Consequently, after the funeral, she is no longer interested in Peter's answers to her questions. Nonetheless, Peter gives her an answer she can use in the irrational concept of "smaller infinities." Act 1 (initial approach): Hazel-Grace is depressed, determined to be realistic about her illness, and wants to isolate herself from all but her parents. Part of the problem is that her friends want to help her through her battle with cancer, but they can't because she knows "there is no through." Hazel-Grace is fond of Peter's book because it reflects her belief that nothing one does matters since death and oblivion are inevitable. The book ends abruptly, like most people's lives. Act 2 (growth): Hazel grows more fond of Augustus and his optimistic, idealistic attitude, but there seem to be a lot of evidence suggesting she should not form a romantic relationship with him, to spare him the pain of her death. This is an attitude which Peter supports (in a letter to Augustus). Hazel-Grace's death could be a replay of Caroline's. Hazel-Grace remembers her mother's fear of not being a mom anymore if Hazel-Grace dies. Her relapse reminds her that "You don't always get what you want." A swing set she received as a child but hardly used reminds her that having cancer means not having a normal life. Act 3 (personal crisis): Visiting Anne Frank's house in Amsterdam, Hazel-Grace struggles to reach the top of the stairs and hears how Anne nearly survived. In that moment, Hazel decides she does want to live and to be seduced. She and Augustus kiss and are applauded by the crowd. Act 4 (resolution): Learning that Peter is a survivor too helps Hazel-Grace understand the cost of unflinching realism, which she ultimately rejects. She thinks, "Who is Peter Van Houten to conclude as fact the conjecture that our labor is temporary?" Act 1 (initial approach): When Hazel-Grace first meets Augustus, he claims to be "on a roller coaster that only goes up." He has chosen to be optimistic about making his life meaningful despite losing a leg to cancer and watching his previous girlfriend, Caroline, die from brain cancer. Augustus's greatest fear is oblivion and he wants to play an important role in the world. His favourite book is about a soldier who fights for meaningful causes, defeats all his enemies, and never dies no matter how many times he is shot. Act 2 (complication): While Hazel-Grace is in the ICU, Augustus has a body scan which reveals his cancer has returned and spread everywhere. But he will not let this stop him from pursuing a relationship with Hazel-Grace. He takes her to Amsterdam anyway. Act 3 (crisis): After Amsterdam, Hazel-Grace learns about Augustus's cancer and realizes he is now the grenade rather than her. The cancer forces him to regress. As this happens, Hazel-Grace stops calling him Augustus and starts referring to him as Gus, just as his parents do. Augustus's personal crisis arises when an infected G tube robs him of his last bit of independence, after which he seems to lose his ambition. His death becomes inevitable. Act 4 (resolution): Augustus’s final words (which Hazel-Grace discovers after his funeral), reveal that he continued to see his life as meaningful despite its apparent tragedy. He is happy with his choice to let Hazel into his life. The mark he wanted to make on the world ends up being that his optimism survives through her. Act 1 (setup): When Augustus and Hazel-Grace meet at the support group, Austustus can't stop staring at her (she reminds him of Caroline). They are both instantly attracted to each other, which is a new experience for Hazel-Grace. Act 2 (relationship deepens): Their attraction for each other deepens and they further bond over their desire to find out what happens to the characters in Peter's book. When Augustus touches Hazel-Grace's face, she hesitates but is forced to evaluate her feelings regarding a physical relationship. Augustus explains his frustration with being a virgin. Act 3 (white moment): In Amsterdam, Augustus and Hazel's relationship reaches its zenith. First, they share a romantic dinner. Later, after visiting Anne Frank’s house, they both lose their virginity as they make love for the first and only time. Act 4 (resolution): Augustus dies, ending the relationship. Nonetheless, after reflecting on his final words, Hazel-Grace decides she is happy with the "smaller infinity" of their time together and her decision to let herself be hurt by the experience. Hazel-Grace achieves her goal of finding out how people can carry on after losing a loved one to cancer. Moreover, she has resolved her inner conflict in a good way by recognizing that the limited time she had with Augustus, a "smaller infinity," was nonetheless a meaningful and valuable experience. Hence, I would say The Fault in Our Stars has a happy ending, despite the tragedy of Augustus's death.